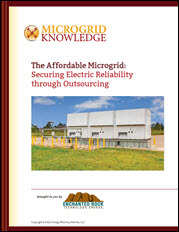 This is part three of a six-part Microgrid Knowledge Special Report Series that highlights the rise of the reliability-as-a-service model and the onset of the affordable microgrid. This post focuses on how the reliability-as-a-service model paves the way for microgrid installation without high upfront costs and development and operational hassles. Microgrids are often customized to meet the needs of the host, whether it is a municipality, hospital, retailer or manufacturer. Because each organization’s needs are unique, it is difficult to compare costs across different installations. For example, population density in an urban setting can increase engineering costs. They can also involve more lengthy and difficult regulatory proceedings, also raising costs. In a recent report, GTM Research put advanced microgrid costs in a range from $1,100/kW to $4,400/kW, with university and island microgrids at the lower end and remote community and commercial microgrids on the higher end. One important price trend, however, is that microgrid component costs — such as energy storage systems and control technologies — are falling as demand is increasing. In addition, natural gas, which fuels many microgrids, has experienced historically low prices in recent years. Overall, three main components drive microgrid costs: generation, infrastructure and automation or control. Generation assets are usually the highest cost in a microgrid, but this varies depending on whether the microgrid installation is a greenfield project or is being built on top of, or in addition to, existing infrastructure. The controller is usually the smallest cost component, but it is also one of the components that is more affected by economies of scale. A controller for a 10-kW system will be cheaper than a controller for a 100-kW system but will comprise a higher percentage of the project’s budget. The microgrid’s purpose, usually driven by customer needs, determines the optimal design that affects costs. GTM Research expanded its definition of microgrids to include basic as well as advanced microgrids. Basic microgrids have one distributed energy resource (DER), usually a natural gas or diesel generator. 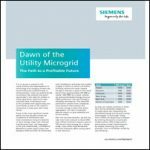 In contrast, advanced microgrids use multiple DERs, such as generators, renewables and storage, as well as a sophisticated management system to serve multiple buildings and optimize loads effectively. The expansion of the definition resulted in GTM adding 1,500 microgrids to its database, bringing the total number of operating microgrids to 1,623. A business model growing in popularity allows customers to have the energy reliability benefit of a microgrid without the high upfront costs and hassle of developing and operating their own. A theme common to both basic and advanced microgrids is their ability to island, or disconnect, from the central grid and use their own energy assets to provide power to their customers for at least 24 hours. However, 24 hours of power would not be sufficient after a significant weather event. For example, after Hurricane Harvey, ERock powered 21 sites across Houston for as much as 105 hours. As the microgrid market grows, the array of business models also expands. GTM estimates that about 58 percent of microgrids will be basic — built for customers who want resiliency but don’t have the experience or expertise to address regulatory and market complexities with an advanced microgrid. These customers also may be reluctant to make a high upfront capital expenditure in their energy plant. They are not energy developers by nature, and a microgrid’s expense may deter from their core needs. A business model growing in popularity allows customers to have the energy reliability benefit of a microgrid without the high upfront costs and hassle of developing and operating their own. Called “microgrid-as-a-service” or “reliability-as-a-service,” the model contracts with a third party that covers the project’s capital and operating costs in return for predictable service fees over time. This approach has proven key to growth in other energy markets, among them solar and energy efficiency, because it is a familiar approach: Customers are accustomed to paying for their energy monthly via utility bills. A theme common to both basic and advanced microgrids is their ability to island, or disconnect, from the central grid and use their own energy assets to provide power to their customers for at least 24 hours. Microgrid developer Enchanted Rock (ERock) uses this model, which it calls On Demand Electric Reliability. ERock installs natural gas-fired generator microgrids on customer sites. Texas Microgrid, financed by an investment from Basalt Infrastructure Partners, owns the microgrid, and ERock operates and maintains the system for the life of the agreement. This arrangement lessens the financial burden on the customer as operation and maintenance expenses are one of the largest components of ongoing costs. That makes ERock’s model the most affordable solution with the highest reliability in the marketplace, he added. ERock used that model for a deal with Buc-ee’s, a chain of Texas mega travel centers. The first phase covers 10 Buc-ee’s stores, but the chain eventually intends to use ERock’s microgrid reliability service at all locations. ERock has also used the model in an agreement struck with H.E.B, a Texas based chain of 350 grocery stores. The initial phase covers 105 stores across Texas and continues to grow. The natural gas-fired microgrids allowed more than a dozen affected stores to remain in service when Hurricane Harvey knocked out conventional power to the area. “It is a model that fits well for other customers that value reliability,” said Clark Thompson, founding partner and chief technology officer at ERock. In addition to large grocery store chains, he cited health care services, regional hospitals, universities, and data centers as likely beneficiaries of On Demand Electric Reliability. In the next chapter of this series, we explain the benefit of using a microgrid that operates on natural gas when employing the reliability-as-a-service model.